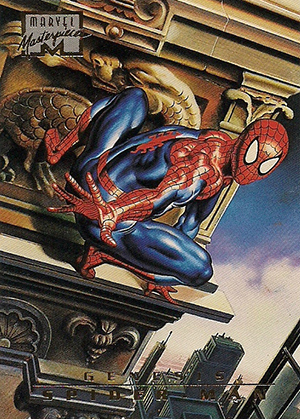 1996 Fleer/SkyBox Marvel Masterpieces is the fifth set in the high-end, high-art line. Overlooked somewhat at the time of its initial release, the set has since become a modern classic. It's extremely valuable and sealed boxes always cause a stir on the very rare occasions that they surface. The 1996 Fleer/SkyBox Marvel Masterpieces base set has 100 cards. All feature detailed artwork by renowned fantasy artists Boris Vallejo and Julie Bell. The first 54 cards are character cards that cover the heroes and villains of the Marvel Universe. 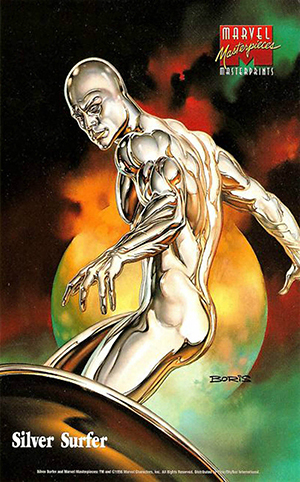 Vallejo and Bell's artwork adds a sense of realism to the characters. Other subsets include Duels and Legacies (#55-84) and Genesis (#85-99). The final card in the set is a checklist. In a testament to the set's popularity, 1996 Fleer/SkyBox Marvel Masterpieces commons often sell for as much as most contemporary base sets. It's not unheard of for complete 100-card sets to top $500. 1996 Fleer/SkyBox Marvel Masterpieces has a pair of basic insert sets. Double Impact are dual-sided cards that have an image from Vallejo on one side and Bell on the other. Singles in the six-card set are inserted 1:4 packs. Gallery cards (six cards, 1:3 packs) have a thick gold foil border, giving them the feeling of being a painting. The ultimate chase comes in the form of redemption cards for original artwork from the set. Inserted 1:60,000 packs, completists still covet them even though the opportunity to get the paintings has long since passed. 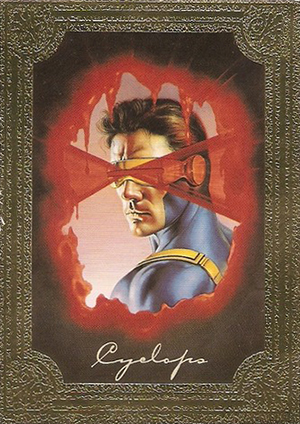 1996 Fleer/SkyBox Marvel Masterpieces cases came with an over-sized Master Prints card. There are two in the set. With its high-end initial price tag, a lot of collectors and dealers were scared off by the set initially. But this led to an extremely low print run. Combine that with the high quality of the cards and the artwork and you've got a perfect storm for a modern classic comic card set. MARVEL MASTERPIECES 1996 - Double Impact Card #5 - Storm Spider-Man - Scarce! MARVEL MASTERPIECES 1996 - Double Impact Card #6 - Wolverine Venom - Scarce! MARVEL MASTERPIECES 1996 - Base Card #53 - Warlock - Scarce! MARVEL MASTERPIECES 1996 - Base Card #57 - Genesis - Scarce! MARVEL MASTERPIECES 1996 - Base Card #66 - Dr. Octopus - Scarce! 1996 MARVEL MASTERPIECES BASE SINGLE CARDS! AVENGERS Genesis Duels BORIS JULIE! 6 cards. Inserted 1:4 packs. 6 cards. Inserted 1:3 packs. 9 cards. Inserted 1:60,000 packs. Cards could be redeemed for original artwork used in the set. 2 over-sized cards. Inserted as case topper. Are these available anymore? I’ve been searching for a box. Doreen Davis � Boxes are EXTREMELY hard to find and very price. They pop up very infrequently. If only I had the money…. I saw that listing and started to cry. Found it for $749.95 also on ebay from a place called “Stuff_from_Bob_and_Betty. I’ve dealt with them before but can’t afford their price either. I have a few of these cards…the one subset missing is the canvas set. It has a 6 card set, the first is Carnage (which I have). any information on this subset? David, I think your card may actually be from Fleer Spider-Man Premium:Eternal Evil. I think I have 10 unopened packs of these. I’m trying to make sure they are 1996 and not 1995, but I can’t find a image. Jake eddy- The 1995 Marvel Masterpieces packs came in varying colors- Purple, Green and Red (I believe that’s it). The 1996 MM came in a black wrapping with a card (it was packaged inside of a hanging display card). The packages will be clear about what they are and say either 1995 or 1996. Hope this helps. If anyone is interested, I have this set with several EMPTY/OPENED packs, an EMPTY display box and the two Masterprints (signed by the artists). All cards are in NM condition. I am accepting reasonable offers. You can e-mail me at duley1j@yahoo.com and we can discuss this. If this type of post isn’t allowed, please just delete it and accept my apology. Thank you! I have about 200 cards from this era I am looking to let go and I am right in the middle of doing the complete inventory of the whole lot. 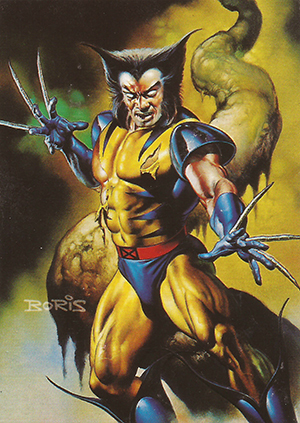 It includes 1996 Fleer Marvel Masterpiece cards as well as Canvas cards from 1995-96. I am looking for a current price list -can anyone point me to a reliable resource?